In short: Yes, it is a real place, and how incredible it is depends on how you feel about enormous Texas ranches. King Ranch is, even by Texan standards, enormous; at over 825,000 acres, King Ranch is one of the largest ranches in the world and is almost 50,000 acres larger than the state of Rhode Island. The ranch, which grows crops, raises cattle and horses, and performs research and development for agricultural companies, includes portions of six counties and makes up the majority of two counties all by itself. Ford’s relationship with King Ranch started in 1999, and came about more less exactly how you might expect: a giant ranch needs a lot of trucks, and King Ranch has such a powerful association with the American West and ranch life that Ford saw the potential for a beautiful partnership. 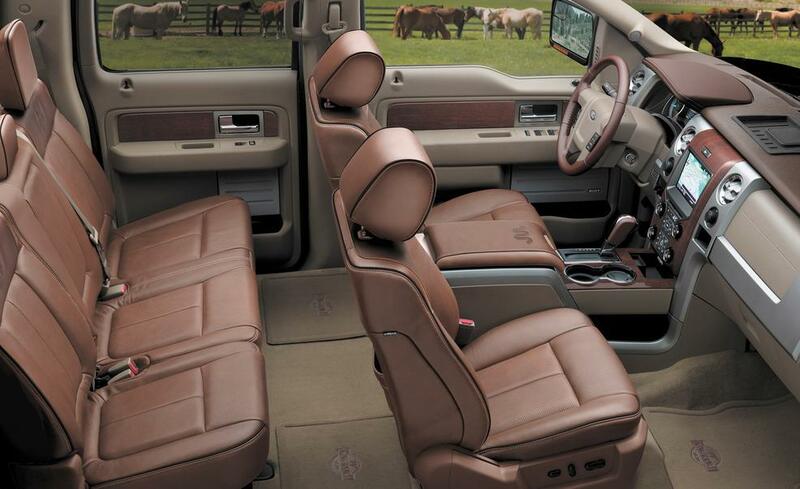 Now Texas’ largest ranch is full of Ford trucks, and America’s favorite truck is available with the kind of soft, rich leather that made King Ranch a Texas institution. Anyone familiar with Ford’s King Ranch vehicles recognizes the distinctive King Ranch insignia, known as the “Running W.” This logo, whose original meaning is lost to history and passionately debated, is the same shape as the brand that King Ranch cattle bear. Whether you think it looks more like Western Diamondback Rattlesnake or a crown fit for a king, one thing is for certain: when you see the King Ranch brand on a truck, you’re looking at one of the most luxurious, capable vehicles on the road!